The office of the Independent National Electoral Commission (INEC) in Qua’an Pan Local Government Area of Plateau State has been razed down by fire. According to a statement issued in Jos on Sunday by INEC’s Head of Media, Publicity and Voters Education, Mr. Osaretin Imahiyereobo, the incident occurred on Saturday night. 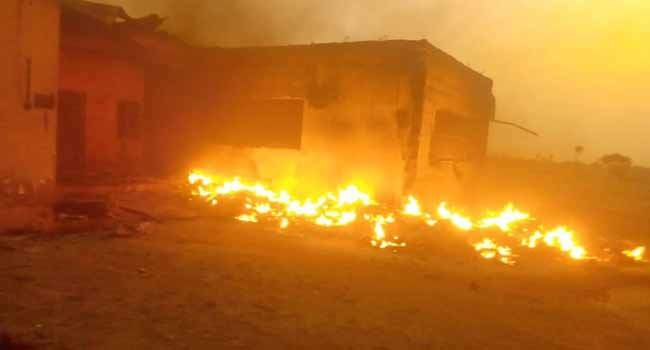 Imahiyereobo said the incident, which is coming barely a week after INEC’s office at Umu-Ikaa in Isiala-Ngwa South Local Government Area of Abia State was burnt had caused a serious setback to the Commission’s preparations for the forthcoming general elections. “A drunken security man was said to have caused the fire outbreak. The office is completely burnt with all its contents – ballot boxes, generator sets that have been serviced and filled with fuel, cubicles, newly printed electronic and manual voters’ register, uncollected permanent voter’s cards (PVCs), materials for the preparations of RAC and other materials yet to be identified,” Imahiyereobo said. He added that the management team of the Commission led by the Administrative Secretary, Gbadamasi Rasheed had gone to the local government to assess the situation. Also confirming the inferno, the INEC Head of Public Affairs, Mr. Bamidele Oyetunji said the Police were already investigating the incident to unravel and apprehend all those who carried out such an act.